Tabloid intrusion into the lives of the famous via the photo lens was a feature of Edwardian, as well as contemporary, Britain, as Nicholas Hiley here intriguingly reveals. 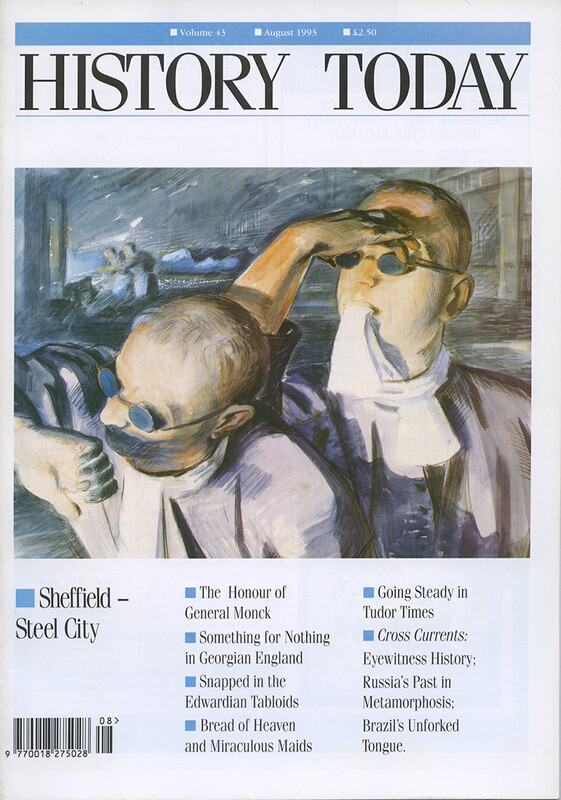 Geoffrey Tweedale on Sheffield's history of steelmaking. Can History ever be True? The cases of women in early modern England who claimed to survive by little but faith alone are described by Walter Vandereycken and Ron Van Deth. Mark Stoyle uncovers the juvenile delinquency of the man who saved the Stuart monarchy and brought back Charles II. Tony Aldous discusses the proposals for an enlarged Bede Museum in the North-East. Paul Dukes looks at how history, like everything else in Russia, is being turned inside out. Blake Pinnell explains how an ancient tradition got out of hand and drained the public purse of 18th-century England. With a hey nonny-no - but the courtship of Elizabethan lads and lasses was not quite as buccolic as the madrigals suggest, as Eric Carlson explains.